What is often called the global anti-apartheid movement focused primarily on South Africa. Discussion of that movement rarely mentions South African-occupied Namibia, where apartheid policies were also applied. Yet a range of solidarity movements supported the South West Africa People’s Organisation (SWAPO) in its long struggle to end apartheid rule and achieve Namibian independence. This chapter first relates anti-apartheid to the decolonization of apartheid-ruled Namibia, then considers various examples of transnational solidarity with that process, exploring aspects of the activities of such organizations as the Namibia Support Committee (NSC) in Britain, the Non-Aligned Movement (NAM) and the Organisation of African Unity, along with the governments of countries such as Sweden, the German Democratic Republic, Cuba, the Soviet Union and the Frontline States in Southern Africa. The chapter concludes by relating these various forms of transnational solidarity with SWAPO’s struggle to the global anti-apartheid movement. 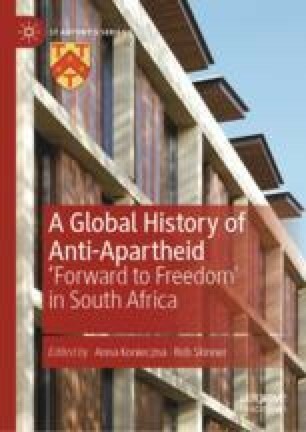 It suggests the need for more scholarly attention to be paid to the relationship between the activities of the global anti-apartheid movement and the long struggle for Namibian independence. Anti-Apartheid and Southern Africa Collection Guide. Social history. https://socialhistory.org/en/collections/anti-apartheid-and-southern-africa-collection-guide. Nordic Documentation on the Liberation Struggle in Southern Africa. https://www.liberationafrica.se/audiovisual/photos/africagroups/. South African History Online. https://www.sahistory.org.za. Ivaska, Andrew. “Africa Rising? Or What the New World Order Has to Learn from the Contemporary African Experience.” Unpublished Paper, African Studies Workshop. Harvard, 2015. https://vimeo.com/133478466.